It's one of those days for me that's all waterworks. I can not seem to do a damned thing today without crying my eyes out. 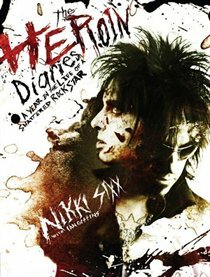 Case in point, I just found out that Nikki Sixx has a new book out. I cried. Over a press release! Why? I could chalk it up to the whole early menopause part of things and leave it at that. But, Nikki Sixx has always had a bizarre effect/hold on me. There is just something about him that is very vampire Lestat-ish. Also, reading the book Committed by Elizabeth Gilbert today for book club. It's left me in a whirl-wind for sure. I actually sat down about an hour and a half ago on here, blogging about something that book sparked in me but decided not to post it. It was a crazy post. It was a crazy set of emotions and thoughts that that book sparked in me. It was a crazy moment that even I thought I sounded crazy talking about so I just left it unposted. Then found myself cleaning up a broken trash bag in the bathroom, thinking about a few broken business partnerships which once again left me in tears. This time, tears of anger. Oh yeah, covered the bases today with the bad emotions. But back to the Nikki Sixx element for a moment. I've had his first book now for a few years. Half way through reading Heroin Diaries . It's just such a heavy book. I mean both physically and emotionally. That's why I'm about mid way through it and it hasn't been touched at all in about two years sitting on my end table in my living room. It's got a very thick layer of dust to prove that too. But I'll have to find some time in the next while to finish it, as I want to get his new one.